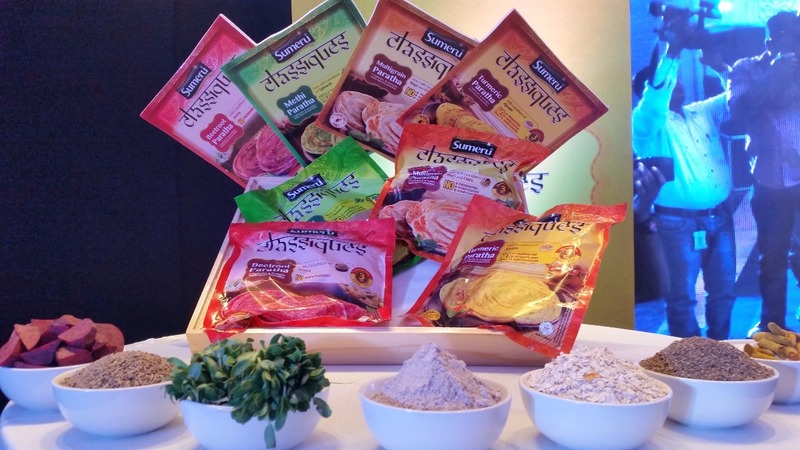 Sumeru has augmented their range of parathas adding new products to their portfolio. 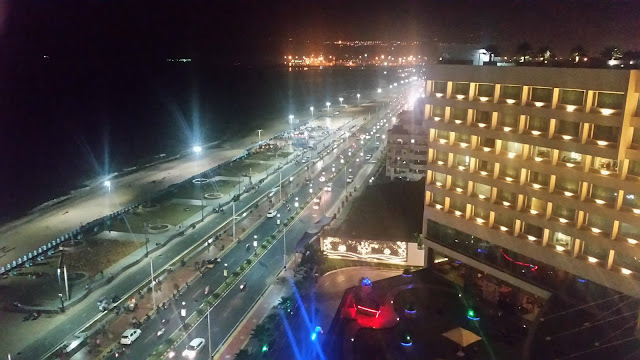 On Monday 21st August, Sumeru unveiled Sumeru Classiques Paratha 2.0 in Hyderabad. 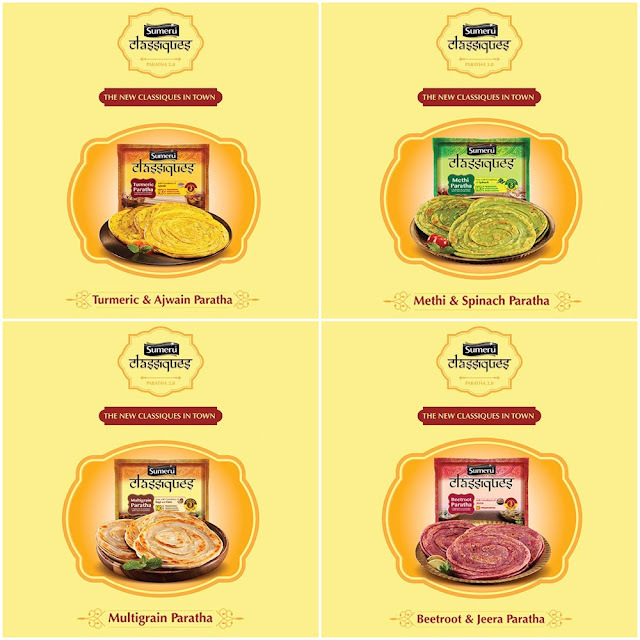 Four new paratha flavours have been introduced – Turmeric and Ajwain, Methi & Spinach, Multigrain as well as Beetroot & Jeera. 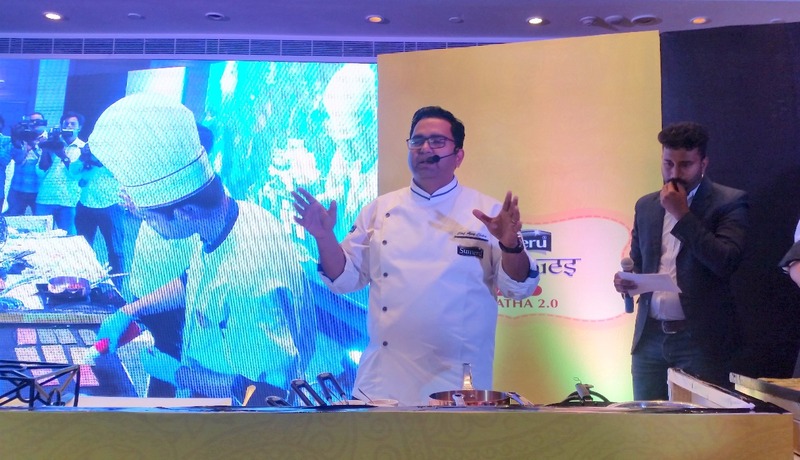 At an event at ITC Kakatiya Hotel in Hyderabad, after an initial briefing about the new parathas by Mr Saurabh Kumar, VP Sales as well as Mr Suraj Sharma – GM Marketing, senior level managers of the company, the stage was set for Celebrity Chef Ajay Chopra to demonstrate three recipes based on the new range of parathas. 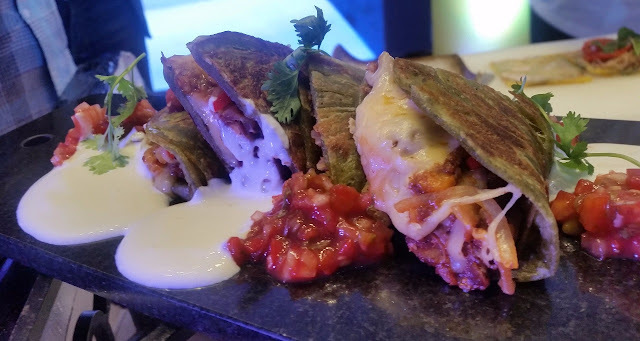 The first recipe demonstrated was Pindi Chole Quesadilla, a fusion of Mexican and Punjabi flavours. Pindi Chole prepared from chickpeas and select masalas, sour cream and Mexican salsa were the main ingredients of the dish apart from Methi & Spinach Paratha. Pindi Chole, sautéed onion and sliced bell peppers were stuffed inside the paratha which was then grilled for a few minutes to prepare the dish. This was then served with salsa and sour cream. 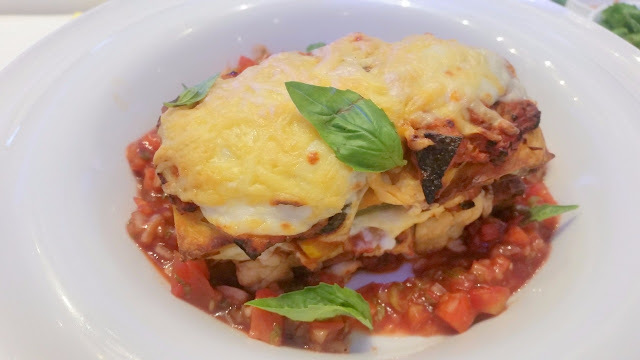 For Vegetable Lasagne, the Beetroot Paratha was chosen. For this, a stuffing was prepared from diced and blanched vegetables, a white butter garlic and onion based sauce and a red sauce prepared from chopped onions and tomatoes. The stuffings and paratha slices were then layered on each other to form three tiers. This is then baked in white sauce and served with grated cheese. For Shammi Kabab Sandwich, a shammi kabab tikki, a preparation of kheema, chana dal and select masalas, was pre-cooked. The parathas were cut into square shapes. 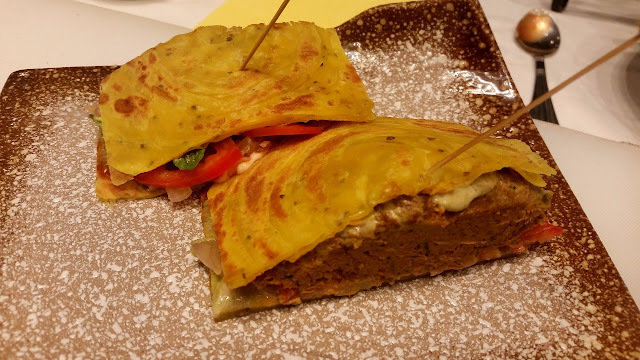 The kabab, as well as mint chutney and onions, were stuffed inside the paratha to prepare the sandwich. It was extremely interesting to see the recipes prepared in such a short time in front of you. The Chef was multitasking efficiently to cut down on the total cooking time. It was obvious that one could innovate many new recipes based on these parathas, and thus enjoy them in different ways. A highlight of the new range of parathas is that it does not have any artificial colours, fats or preservatives, thus making them extremely attractive for health conscious food lovers. As per Chef Chopra, with a little innovation, restaurant-class meals can be enjoyed at home using these parathas. This opens up a new segment of consumers for the already popular product.